This DVD has dozens of uses! Provide a Gen-Lock reference signal or black burst signal using your DVD Player. Setting up external SVGA to NTSC scan converters boxes. Providing test signals on AVI, MPEG, Quicktime or other video files you create to allow the recipient to adjust their monitor for best quality. Need to Create live NTSC/PAL video on your PC? See our PC card solutions for making live video here! Yes we even have the "Indian Head" Test Pattern from the 50's and 60's, plus many others! PLUS all of the test patterns are in the original image format on the DVD Video CD-ROM and ARE READABLE BY A STANDARD CD-ROM IN A PC!! That's right- you can read this CD in your DVD player OR your computer CD-ROM! What does this mean for you? Well, if you are running a Non-Linear Editor or other type of PC program where you need one of these video test patterns (like SMPTE Color Bars) for a leader, test, etc., you get them in the original format and resolution for use in other projects! The images reside in the \pictures directory on the DVD-Video CD and are in BMP, GIF, and JPEG formats at 768x576 resolution (for PAL compatibility) They can easily be resized by any Paint program like PhotoShop to fit the resolution you need, like CCIR 720x486 or 640x480. There are many more test patterns not shown here...all full size, broadcast quality signals. And, our exclusive Pattern Generator will display them FULL SCREEN on your TV, video monitor, LCD projector, or big screen projection TV. 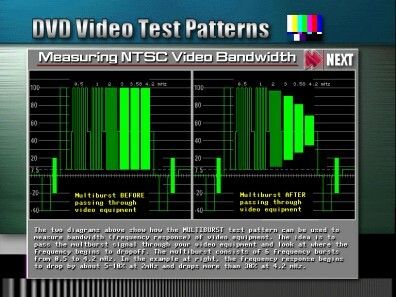 Modern NTSC Test Patterns- every test pattern you need, what it looks like, what it does, and how to use it, plus full screen broadcast quality output using your NTSC enabled video card or scan converter. They are all here, SMPTE, EIA, NTC7, Phillips, Pluge, Crosshatch, Raster, Convergence, the works! Over 80 different styles and resolutions are available on the DVD Video CD. The Classic Test Patterns- The "Indian Head" from the 50's, the EIA and SMPTE patterns, even printable camera tests known as "chip charts". All the great classics. LCD Monitor/LCD Video Projector Test Patterns- have you ever had to setup a video projector and had trouble getting the focus and contrast set right? Our test patterns make it easy? Menu Driven Test Pattern Generator- lets you choose and display all the patterns full screen using your remote control. Multimedia Test Program- Check out the most important multimedia features of your DVD Player to ensure it can handle the job, check Color, Audio playback, Video Playback and much more. Video Countdown Generator- have you ever wanted a good animated 5,4,3,2,1 countdown? well we have it! Digital High quality with "beeps". Bars and Tone Generator- Full Field EIA or SMPTE with 1 kilohertz at -6 DB! Picture show- Once you've got it aligned, now you need to test it with high quality images...we provide a self running picture show of stunning high quality full color images from around the world to give your video system a true workout! What can you do with the DVD Video CD Reference Suite? Turn your DVD Player into a TV pattern generator or sync generator rivaling systems costing thousands of dollars. Send test patterns through your entire video system to align tape decks, projection TV's, monitors, etc. Included is an interactive video tutorial, measurement, test, and reference All screens are fully detailed and many contain actual video and waveforms that have been imported using computer video interfaces. You'll be able to see how video is measured using waveform monitors and vectorscopes. 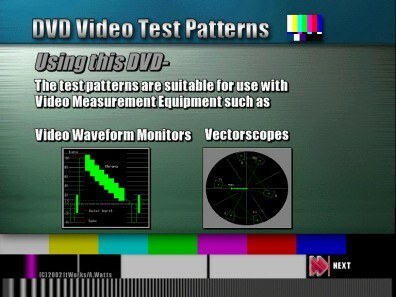 This screen describes using a waveform monitor or vectorscope to measure NTSC or PAL video Luminance and Chrominance Levels. We provide you not only with the definitions, but also example samples of how the signals should look and what the different components mean. 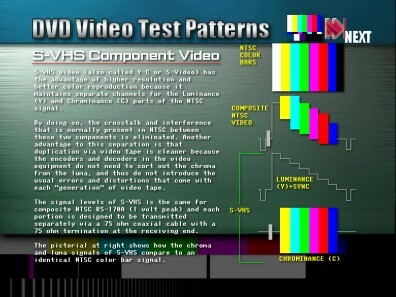 This screen describes how Full Field Color Bars test Pattern relates to the S-VHS component video signal and compared to NTSC or PAL composite video signal. Our easy to understand visuals help even the novice see how video works. This screen describes the "multiburst" test signal and how it is use to measure bandwidth of a composite video signal. This is one of dozens of tutorial screens that show you how to measure NTSC or PAL Video with a Waveform Monitor and Vectorscope. Need to Create live Broadcast Quality NTSC video on your PC? See our PC card solutions for making live video here! Copyright © 1990-2002 ItWorks. All Rights Reserved.